A bid of 1,000gns secured the top price for DJ & GA Watkins of Craswell,Herefordselling their home bred lamb ram at the Rouge Sheep Society annual show and sale held at Borderway. More sheep were sold on the previous years sale and the overall sale averages also saw a rise throughout. A son of Bennachie Knightrider and bred from a home bred ewe, he was sold to AJ Graham of Antrim, N.Ireland. The home bred lamb from Moore Hamilton of Londonderry, Glengalliahg Lawson, a son of Kinsella Jackpot and is out of a Hiltonstown Buster sired mother. 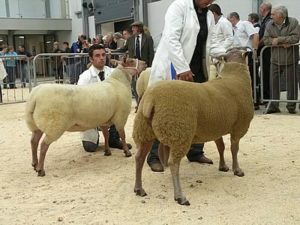 Lawson was knocked down at 800gns to J Gate of Northwich, Cheshire.It was a shearling ram shown by Percy Tait of Broughton Hackett,Worcesterthat came next. This January born ram is a son of Romer Harry and bred from a Broadwood Camilla sired mother. This ram was sold for 750gns to J Charlton & Sons of Cleator Moor. Selling for 720gns was Bennachie King, a son of Magherabeg Collin and out of the Bennachie Baroness family. King, shown by Pat Imlah of Newmachar, lifted the male championship ticket at the pre-sale showing and has already won 2nd prize at the 2011 Royal Highland Show. He was sold to TJ Beckingham of Chesterfield. Heading up the female section was the reserve female champion, a gimmer shown by Percy Tait. This eye catching entry is a daughter of the homebred sire Knighton 238 and carries both the Knighton and Broadwood Fusion through her pedigree. She was also purchased by TJ Beckingham ofChesterfieldfor 800gns.